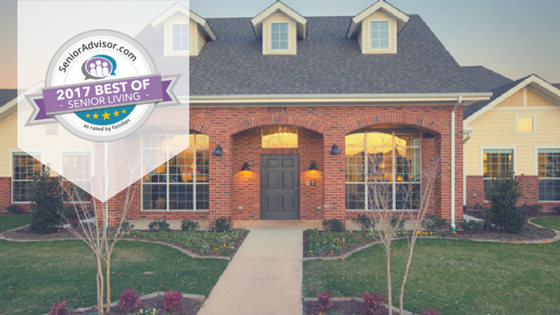 We are pleased to announce The Cottages at Chandler Creek, our state of the art memory care residences serving the Austin/Round Rock areas has been received the 2017 Best of Senior Living Award by SeniorAdvisor.com. This award places us in the top one percent of senior care providers nationwide. The annual SeniorAdvisor.com Best of 2017 Awards recognize outstanding senior living and home care providers who have received consistently high ratings from residents and their families. Winners of the SeniorAdvisor.com Best of 2017 Awards are located all over the country and represent the top tier of in-home care, assisted living, and other senior living providers in the country. We pride ourselves in providing the very best care and services for our residents and their families. At The Cottages at Chandler Creek, we provide two living options: The North and South Cottage. The South Cottage is a brand new state-of-the-art home. The North Cottage, open since 1997, has been completely renovated! Each Cottage offers the same level of care and services. Our more intimate living in groups of 12 – 16 allows the staff to develop deeper relationships with our residents. And, this smaller setting allows the residents more comfort and familiarity while living with dementia. If you would like to learn more about The Cottages at Chandler Creek, please contact us online or schedule a tour.